RANCHO CASITAS was a large ranch and thoroughbred breeding farm located approximately 15 miles inland from the town of Ventura in southern California. Rancher Walter Hoffman ran Corriente cattle and bred thoroughbreds here between 1916 and his death in 1955. Hoffman was active in the state's resurgence in breeding thoroughbreds, and was a founding member of the California Breeders Association (now the California Thoroughbred Breeders Association), and its first president. CRUSADER (1923 - 1940), bred by Samuel Riddle at Faraway Farm, Kentucky, was a son of Man o' War, and the one many said most resembled his famous sire. He was a high class juvenile, but even better at age three, when he was named Horse of the Year, having won the Belmont Stakes, the Jockey Club Gold Cup, the Suburban Handicap, and other big races. At age four he won the Suburban again under 127 pounds, giving away weight to the rest of a high class field and cantering in on his own in 2:02-3/5. He was kicked at the post during the Brooklyn Handicap, and while he continued to race that season, he was never the same. In all he won 18 races, was eight times second and four times third in 42 starts. Riddle leased Crusader to Phil Chinn at Himyar Farm, Kentucky for some years, and then he was leased to Hoffman, who took him to Rancho Casitas, where he stood until his death at age 17. Crusader was not particularly successful at stud, either in Kentucky or California. CRYSTAL PENNANT (1924, by Pennant) was a good California runner, winner of seven races, including the very rich Coffroth Handicap at Tijuana, where he beat the imported Cambridgeshire Handicap winner Masked Marvel II by a length. Beginning in 1952, construction was started on Casitas Dam, to alleviate water rationing caused by irregular California rains, supported by the area's cattlemen and citrus ranchers. 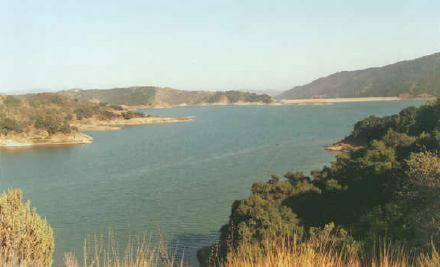 The $31 million reservoir, Lake Casitas, completed in 1956, inundated a portion of Rancho Casitas, including the grave sites of the horses buried there. The lake, which is the source of drinking water for Ventura and surrounds, is now a popular recreation area, and served as the site of the 1984 Olympic canoeing and rowing events. The part of Rancho Casitas not covered by the lake passed to Hoffman's daughter, Katherine Hoffman Haley, after his death, and under her tenure the ranch was devoted to raising shorthorn cattle and quarter horses. Haley Ranch is still operated by Hoffman's descendants.--P.E.